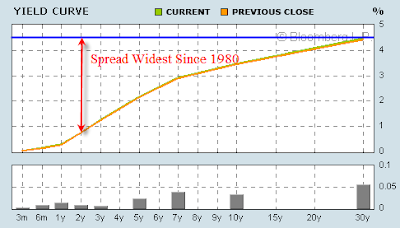 Curve Watchers Anonymous noted an interesting thing on Friday and again today. The long end of the yield curve is rallying or steady (yields declining), while the middle portion of the curve is selling off (yields rising). This happened on Friday and again today. On Friday, the 2-year, 3-year, 5-year and 7-year yields rose, with the 5-year and 7-year yields rising more than the 10-year yield. 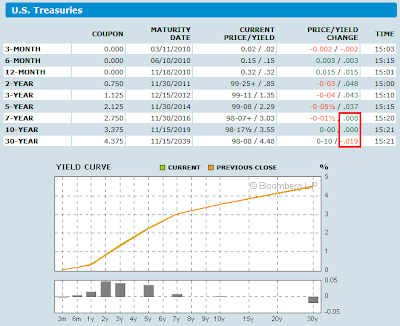 The long bond yield dropped. Today, the long bond (30-year) treasury yield is lower again, with the 10-year yield flat, while the 2-year, 3-year and 5-year yields are rising. This is not normal action to say the least. On December 11, in Yield Curve Steepest Since 1980; Hard Times Ahead in 2010 I stated "Judging from action in the 5-year treasury, it appears as if there is a long 3-to-5 year, short 30-year trade in play." Here is a chart I made last Thursday, and posted Friday. The difference between Treasury two- and 10-year yields may widen to record levels set last month as the U.S. economy recovers, according to Pacific Investment Management Co., which runs the world’s biggest bond fund. “Long-term rates will rise at a faster speed than short- term rates,” Pimco portfolio manager Tony Crescenzi wrote in a report distributed by e-mail early in the Asian trading day. “Market participants decided months ago that the Armageddon scenario was out and stabilization was in,” he said. 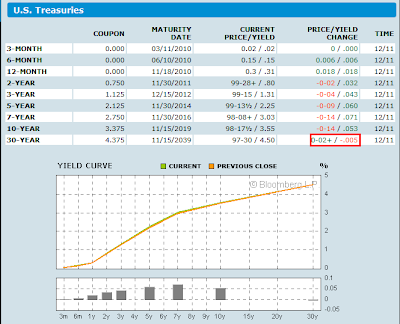 The so-called yield curve steepened to as much as 2.62 percentage points today, the most in almost four weeks. It rose to a record 2.82 percentage points on June 5 as investors demanded greater compensation for the risk that growth will spark inflation. Just a week ago, investors said the curve would narrow on signs the global economic recovery was petering out. Clearly that was a good play and I congratulate PIMCO. Should the pattern from today and last Friday continue, it would be a reversal of a long 3-to-5 year, short 30-year trade in play. One of the interesting features about options is that there’s a relationship between calls, puts, and the underlying stock. And because of that relationship, some option positions are equivalent -- that means identical profit/loss profiles — to others. Why is that important? You’ll discover that some option combinations -- called spreads -- are easier, or less costly to trade than others. Even with today’s low commissions, why spend more than you must? If you want a simple proof that the above equation is true, consider a position that’s long one call and short one put. When expiration arrives, if the call option is in the money, you exercise the call and own 100 shares. If the put option is in the money, you’re assigned an exercise notice and buy 100 shares of stock. In either case, you own stock. Note: If the stock is at the money when expiration arrives, you’re in a quandary. You don’t know if the put owner is going to exercise the put. Therefore, you don’t know whether to exercise the call. If you want to maintain the long stock position, the simplest way out is to buy the put -- paying $0.05 or less — and exercise the call. There’s one equivalent position that you, the options rookie, should know, because these are strategies you’re likely to adopt. Take a look at a covered-call position (long stock and short one call), or S - C.